the substitution of bank lending with peer-to-peer lending on the basis of digital platforms. An area where digitalisation has already made progress is the use of cash in payments. In the member states of the euro area from 1980 until today, the share of cash in the money stock M1 has declined from 23% to 14%. However, as a recent study by the ECB (Esselink and Hernández 2017) shows in terms of number, still 79% of all transactions were carried out using cash, which amounts to 54% of the total value of all payments. But this could change rapidly. As the study shows, 81% of all payments at point-of-sale terminals in the euro area are below €25. At the same time, more and more payment cards and point-of-sale terminals are enabled with contactless technology for payments below this threshold. What would a completely cashless economy imply for monetary policy? First, it would remove the zero lower bound for interest rates. This would increase the central bank’s room for manoeuvre in deep recessions, above all in a deflationary environment. Second, it would remove the risk of a general bank run, as depositors could only switch their deposits between banks but not totally out of the banking system. This would reduce the need for the central bank to become active as a lender of last resort. On the other hand, one could argue that if savers can no longer withdraw their deposits, this could reduce or even remove the market discipline for the banking system. But for these effects to materialise, it is not sufficient that the usage of cash approaches zero over time. It would require that cash is totally abolished. As long as the convertibility of bank deposits in cash is possible, the use of cash could rapidly rebound if interest rates become significantly negative or if the health of the whole banking system is at stake. Thus, in the area of cash, digitalisation by itself cannot lead to a qualitative change for monetary policy. But a vanishing use of cash in daily payments could facilitate a political decision to abandon cash altogether. However, at least from the German point of view, a fully cashless euro area is very unlikely for the time being. money that is transferred in a peer-to-peer nature (cash or digital money recorded in a distributed ledger) and money that is transferred in accounting systems with a central book-keeping agency. Graphically, such a taxonomy can be represented by a ‘money flower’ (Figure 1). The idea goes back to a study by the Bank for International Settlements (Bech and Garratt 2017). But instead of the criterion ‘convertibility versus non-convertibility’,1 the Bank for International Settlements uses the criterion ‘limited versus general accessibility’. The other three criteria are the same. 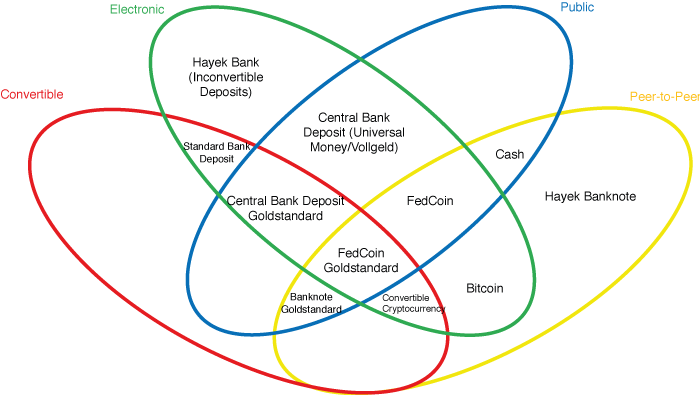 Without going into detail, the taxonomy makes clear that, due to their inconvertibility, cryptocurrencies have a strong similarity to traditional central bank reserves and cash. In this respect, cryptocurrencies differ from bank deposits, which promise convertibility in cash. Of course, private inconvertible money could be also issued in cash (Hayek banknotes) or by banks that offer deposits that are inconvertible but recorded in traditional centralised accounting systems (Hayek bank deposits). Are cryptocurrencies a serious challenge to cash, traditional bank , or central bank reserves? Due to their inconvertibility, they do not have an intrinsic value. While this is also true for cash and central bank deposits, the monies issued by central banks have the enormous advantage of being a legal tender. This is an important protection against the full implosion of the value of a money without intrinsic value. An important additional value protection is provided by the legal mandate of the ECB and other central banks to maintain price stability which so far has been achieved remarkably well. While an individual issuer of a cryptocurrency can try to install a value guarantee by setting an upper limit for the issuance of its currency, the logic of currency competition implies that there is no limit on the number of issuers. Thus, there is also no limit of the total amount of the aggregate stock of cryptocurrencies. Holding a cryptocurrency always bears the completely unpredictable risk of a total loss. In other words, as a store of value the high volatility of cryptocurrencies makes them unattractive for most investors. Cryptocurrencies are also not attractive as a means of payment. As Bitcoin shows, production costs are becoming prohibitive, transaction costs and transaction times are high. In addition, due to the distributed ledger all transactions are public. In other words, if the public key of a user is known, all his transactions become transparent. Overall, cryptocurrencies do not have the potential to replace the established national monies nor to have a relevant impact on monetary policymaking. As far as they are used to circumvent laws against money laundering, adequate legal restrictions are required. With the emergence of cryptocurrencies and the reduced demand for cash especially in countries like Sweden, some central banks have started to develop concepts for allowing non-banks to hold deposits with the central bank. The most elaborate concept is the e-krona developed by the Swedish central bank (Sveriges Riksbank 2017). Digital central bank money for non-banks could become a substitute for cash, especially if the value is stored locally on an app or a card (value-based solution). At the same time, it could become a substitute for traditional bank deposits if the balance is stored in accounts in a central database (register-based solution). Deposits with the central bank could become a very attractive investment as they would provide a totally safe asset. This feature would be appreciated above all by private households and firms with bank deposits exceeding €100,000. With the Bank Recovery and Resolution Directive, such investors are exposed to the risk of a bail-in which they could avoid by holding central bank deposits. Of course, the attractiveness of such deposits depends on their interest rate relative to the interest rate of bank deposits. Assuming a situation where all citizens have a bank account with the central bank, the run risk for commercial banks (a ‘digital bank run’; Cœuré 2018) would be increased, as it makes it much easier to switch especially higher deposits out of the banking system. In an even more extreme scenario where all citizens hold overnight deposits at the central bank, the central bank’s room for manoeuvre would again be increased. It would not only be easier to enforce negative interest rates, it would also become technically possible to use the instrument of helicopter money. The central bank would simply credit a certain amount to the account of each citizen. Widely used central bank deposits would fundamentally transform the role of banks and their relationship with the central bank. The banks would still be able to provide loans. But the banking system would then always need a corresponding refinancing from the central bank, as the loans have to be paid out on the central bank deposit of the borrower. This would come close to the concept of full-reserve banking restricting the bank’s ability to create loans autonomously. However, it does not imply a 100% refinancing by the central bank. The banking system could always try to attract a longer-term refinancing from non-banks out of their central bank deposits. An extreme form of universal reserves is ‘Vollgeld’ (sovereign money). In such a scheme, traditional bank deposits would no longer be allowed. If practiced in a consequent way, the central bank would no longer act as a stabiliser of the money market. This would result in higher interest rate instability (Bofinger and Haas 2018). Digital central bank money for all could also have far-reaching implications for the payment system which is currently based on bank accounts. The role of banks could be reduced in favour of non-banks offering payment services based on central bank accounts. This could offer a potential for innovation and competition in payment services. Therefore, in my view, central banks should refrain from providing payment services. A fourth possible innovation is the substitution of traditional bank loans with peer-to-peer lending. China is leading in this field and it shows the risks and the regulatory challenges that are associated with this instrument. Conceptually, peer-to-peer lending has many similarities to capital market lending as it establishes a direct relation between lenders and borrowers. One can say that peer-to-peer lending creates a ‘capital market for small borrowers’. Digitalisation has the potential to widen the scope of this form of finance, especially if it is based on established internet platforms. Using information from credit scores, social networks or platforms like Amazon, peer-to-peer platforms can provide the screening and delegated monitoring, which is the core function of banks in an environment with asymmetric information. By distributing the investments over a large group of borrowers, peer-to-peer lending can also offer the traditional risk diversification provided by banks. As peer-to-peer lending does not need an intermediary, which bears risks, it has the advantage of needing less regulation than traditional bank lending. This concerns above all capital requirements and liquidity requirements. So far, peer-to-peer lending is still in its infancy, but it could have the potential to become a similar challenge to the traditional bank business as Uber is to the traditional taxi business. For the central bank, an ‘uberisation’ of banking could imply less influence on financial processes and also on real processes. In the same way as capital markets, peer-to-peer lending makes it possible to mobilise the existing money stock for additional lending. But as long as bank deposits remain the main input for this form of financing, the central bank will be able to influence peer-to-peer lending with its interest rate policy. The decision of an investor to use money that is held on a bank account for peer-to-peer lending will depend on the interest rate that she receives for such a deposit. With its control of the money market interest rate, the central bank can indirectly target the interest rates for such deposits. The digitalisation of money has the potential to change traditional structures of the financial system. It can redefine the roles of banks and central banks. But by itself, digitalisation does not erode the control of central banksover the financial system. Massive regime changes (abolishment of cash, universal central bank reserves) are possible. However, they would require a political decision and they would not weaken but strengthen the role of central banks. Bankscould be massively challenged by new forms of intermediation, above all by peer-to-peer lending. The decision by central banks to offer central bank accounts for all would fundamentally change the function of banks, above all by limiting their ability to create loans autonomously. In addition, this could also reduce the importance of banks in the provision of payment services. In spite of cryptocurrency hype,they will not become a serious game changer. They may have some attraction for risk-loving investors. But due to limits of their inconvertibility and the unlimited number of issuers, they will hardly come into a position that they could threaten the dominant role of national currencies and traditional bank deposits. Bech, M L and R Garratt (2017), “Central bank cryptocurrencies”, BIS Quarterly Review: 55-70. Cœuré, B (2018), “The future of central bank money”, Speech at the International Center for Monetary and Banking Studies, Geneva, 14 May. Esselink, H and L Hernández (2017), “The use of cash by households in the euro area”, ECB occasional paper No. 201. Hayek, F A (1976), The denationalization of money, London: Institute for Economic Affairs. Sveriges Riksbank (2017), “The Riksbank´s e-krona project”, Report 1, September. This is identical to the ‘inside versus outside money’ definition of money. Corda replaces blockchain with a ‘notary’ architecture. The notary design utilises a trusted authority and allows consensus to be reached on an individual-transaction basis, rather than in blocks, with limited information sharing.